Check back here often – We’ll be posting links to dozens of resources that will help you be a better trainer, handler and hunter. Our favorite books. The best DVDs. Links to videos on different aspects of training or hunting. Organizations that help us in our roles as dog owners, trainers and hunters. You’ll find that and more as we continue to build out this site. If there’s a resource you think deserves to be listed here, let us know through the site. Standing Stone Kennels produces an excellent series of videos on all aspects of training, and adds to them regularly. They test their own and clients’ dogs in the NAVHDA system. Their videos are free to watch on their YouTube channel. You can subscribe here. If you have questions about training not already addressed in their existing videos, send your questions through their Facebook page or website, and they’ll produce a new video addressing that aspect of training. 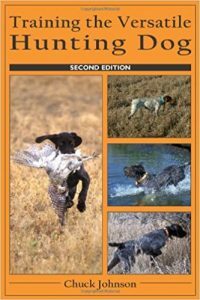 Breeding & Training Versatile Hunting Dogs for Hunting and Hunt Tests is the first book covering both breeding and training of your versatile dog for upland bird hunting, waterfowling, shed hunting, blood tracking, along with numerous human interest chapters. Through his Cedarwood Kennels in Boise, Bob is one of the leading breeders of Pudelpointers in North America. As of the publication of this book, of the 106 dogs Bob trained/handled in NAVHDA’s natural ability test he earned 81 Prize 1s and of the 49 dogs trained/handled in utility he earned 15 Prize 1s with all dogs prizing. Bob’s record speaks for itself, and he shares his entire training philosophy and methods in this book. You can order it on Amazon by clicking here. 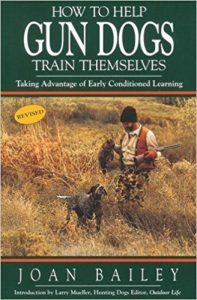 In any discussion of the best books for new owners of hunting dogs, this title seems always to make the list. 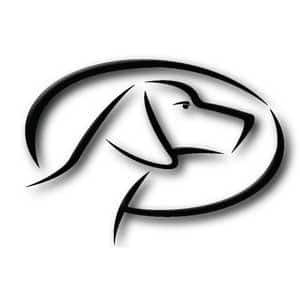 From the Amazon description: An easy to read, step-by-step format that assists gun dog owners by providing proven methods emphasizing socialization, exposure and conditioning during the critical first 12 months of a dog’s life. Over 130 photographs show the reader how to bring your pup along, using the easy, informal, time-tested methods. 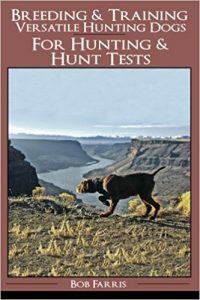 Now in the new, 4th edition, revised, this book continues to help hunters avoid making mistakes during the critical first months of a dog life, mistakes that could ruin an otherwise fine dog. Order it on Amazon by clicking here. This YouTube video has proven useful for a large number of owners who are new to force fetch. This is a Carol Ptak seminar that demonstrates the Gibbons-West Method for force fetch, a method that does not rely upon the ear pinch or toe hitch, and which some trainers find to be more palatable in working with their dogs. The traditional methods for force fetch conditioning work for some, while this method works for others. You can watch the seminar by clicking here. Another highly regarded book. From the description: “Training the Versatile Hunting Dog shows you how to develop a great hunting dog with Chuck s new approach. This approach emphasizes letting your young dog first develop his natural abilities: use of nose, desire, cooperation, search, pointing, and tracking. Then, after his first season, Chuck shows you how to put the controls on your dog with chapters on the trained retrieve and whoa training.” The book also covers water training. Order it on Amazon by clicking here.